There may be nothing at stake when Fleetwood face Walsall tomorrow but John Sheridan does not want his Town reign to end in a testimonial fashion. Both sides head to Highbury after securing their League One status over the past week but Sheridan, who guided Town to safety after taking over from Uwe Rosler in February, wants to end on a high. 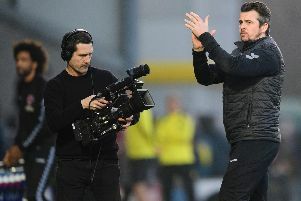 Town have lost their last three games to Blackpool, Wigan and Peterborough, and Sheridan wants another three points before making way for Joey Barton. Tuesday’s results left only Rochdale and Sheridan’s former club Oldham contesting the final relegation spot but the Town boss said: “It does not change my approach. I just want us to be professional, go out there and win the game. “We have got to score goals and we have not scored in the last couple of games, so we have to go out there and be as professional as we can. “If it is a sunny day, I don’t want us out there like it is a testimonial. I don’t want that, no way. I want to be professional. “I want to win every game. I felt we were safe after Oxford (the last game Town won). Whether a few others felt that I don’t know but performances have not been as good and we have not been as solid, even though we have not done a lot different. Like Sheridan, Walsall boss Dean Keates stepped up in the latter half of the season to guide the Saddlers to safety after Jon Whitney’s exit. And Sheridan said of tomorrow’s opponents: “They have always been a good footballing side. Not dissimilar to ourselves, a new manager has gone in there and they have made it really tight. “They have done brilliantly to take four points from their last two games. They got a last-minute goal at Northampton, then a point at Bradford, so they have achieved what they wanted to. “They were in a sticky situation and they have ended up staying in the division. “I’m sure their new manager will be looking to have a better season next time. “We want to win and end on a high, so I want my players to respond to the last couple of results. We’ve let a few goals in, so we need to get back to basics and do what we did previously to win games.